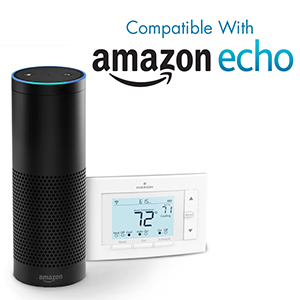 EMERSON’S SENSI™ WI-FI PROGRAMMABLE THERMOSTAT NOW WORKS DIRECTLY WITH AMAZON ECHO. Emerson (NYSE: EMR), a leader in the thermostat and HVAC controls industry, today announced that its top-rated Wi-Fi thermostat now works with Amazon Echo and Alexa, the Amazon cloud-based voice service. The Sensi™ Wi-Fi Programmable Thermostat is one of the first thermostats to work with Echo and Alexa, and it is the most affordable choice in the connected-thermostat category. With just a few steps, customers can easily connect their Sensi thermostat to Echo using the Alexa app. Once the device is discovered, users can simply ask Alexa to change a single thermostat, or control multiple Sensi thermostats at one time by creating and naming connected-home device groups. The Sensi thermostat is Emerson’s first entry into the Wi-Fi thermostat market, a category which is expected to grow to $600 million globally by 2018, according to ABI research. The Sensi thermostat offers several features that differentiate it from other remote-access thermostats. It uses two standard replaceable AA batteries and in most cases can operate with existing thermostat wiring without the need for continuous 24V power, which is not available in nearly 50 percent of homes. It is also the first Wi-Fi thermostat to achieve Energy AwareÔ certification and is one of the most precise thermostats with +/- one-degree accuracy. For more information, visit SensiComfort.com or connect with Sensi thermostat on Facebook (Facebook.com/SensiComfort) and Twitter (Twitter.com/Sensi).